Inscriptions. KAΛOΣ ("fine") to the right of the head of the Amazon carrying a companion.KAΛOΣ Λ ("fine [?]") 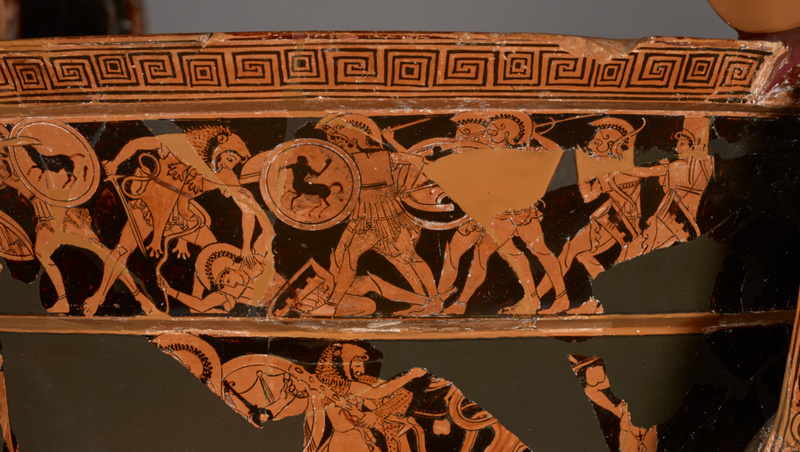 between the heads of the standing Amazons attacking Herakles and his comrade. 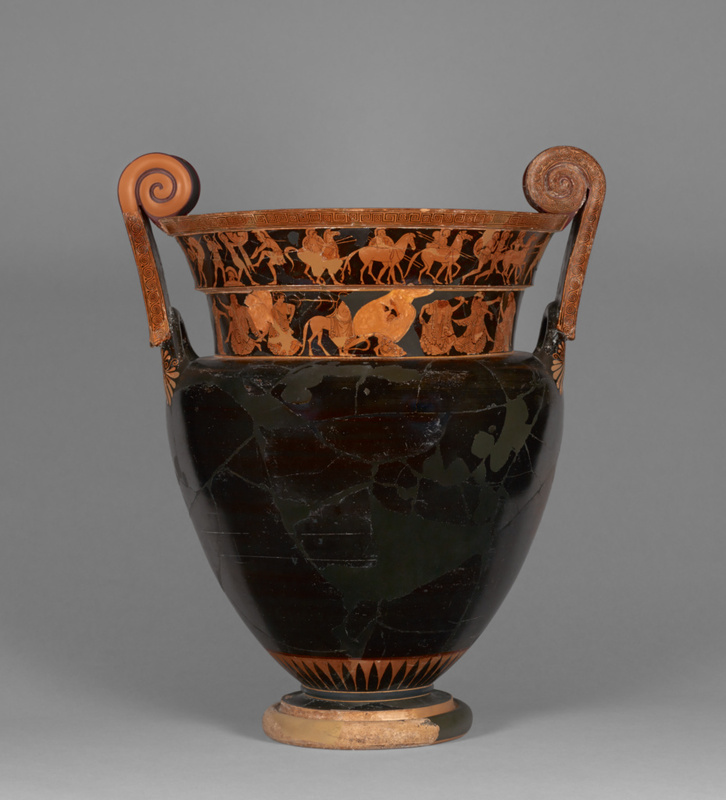 The krater (mixing vessel) has a plain black body and two friezes on the neck. Running around the upper frieze on both sides is an Amazonomachy. Around the lower frieze are three labors of Herakles on side A and Peleus wrestling with Thetis on side B. Much of the Amazonomachy on side A is only partially preserved. 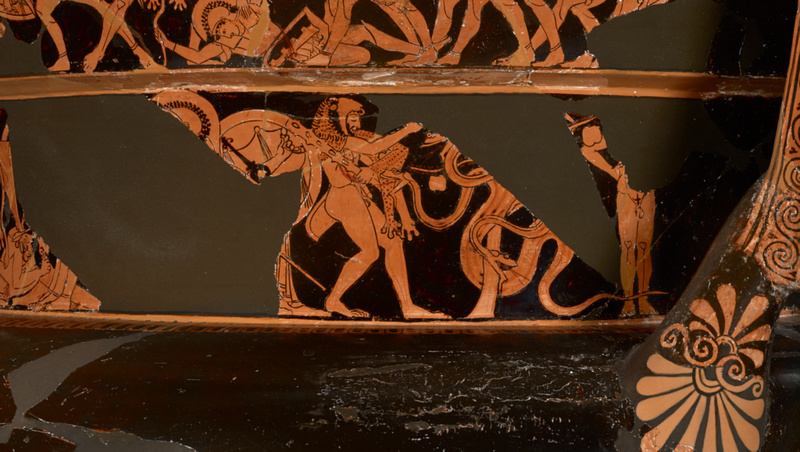 Two small fragments show an Amazon carrying her dead comrade to the left. Further right, an Amazon comes to the aid of her comrade who has collapsed before a Greek warrior. He slashes with his sword, wielding a shield with a horse as the blazon, and is overlapped by Herakles. Identifiable by his lion skin, and with a sword in his right hand, he grasps the shoulder of an Amazon who has fallen at his feet. She, in turn, grips Herakles' upper arm in an attempt to ward off his attack. The fallen Amazon holds a bow and wears a quiver, and is defended by six Amazons from the right. 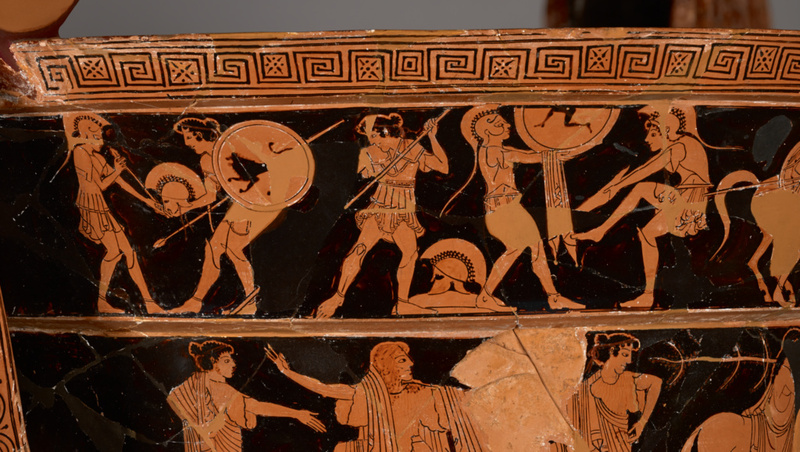 There are two pairs of warriors, one with a frontal hoplite shield (blazon: Centaur throwing a rock), another with a Boeotian type shield, followed by two archers (one is helmeted, the other wears a soft cap). On side B, the Amazons arm and run into battle. From left, an Amazon facing right tests an arrow, before her comrade who is armed with her shield (lion blazon) and spear, and holds her Corinthian helmet. Further right, an Amazon turns, holding her spear obliquely. Her shield and helmet rest on the ground. 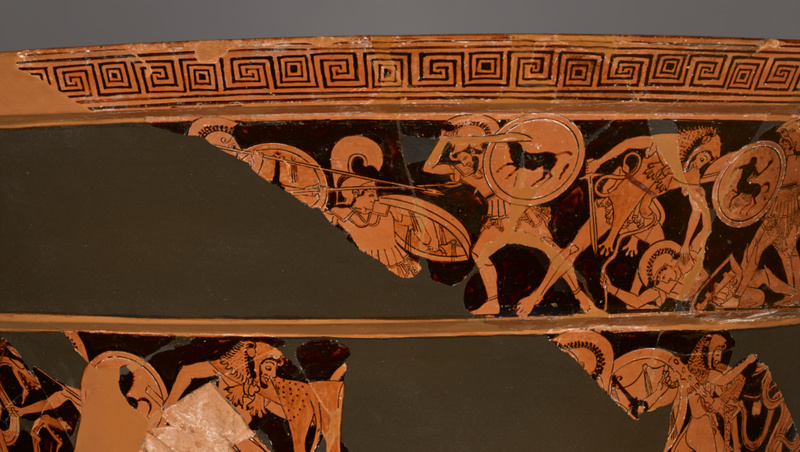 To the right are two more arming Amazons, one holding a shield (frontal view, triskeles (?) blazon), the other fitting a greave to her leg. 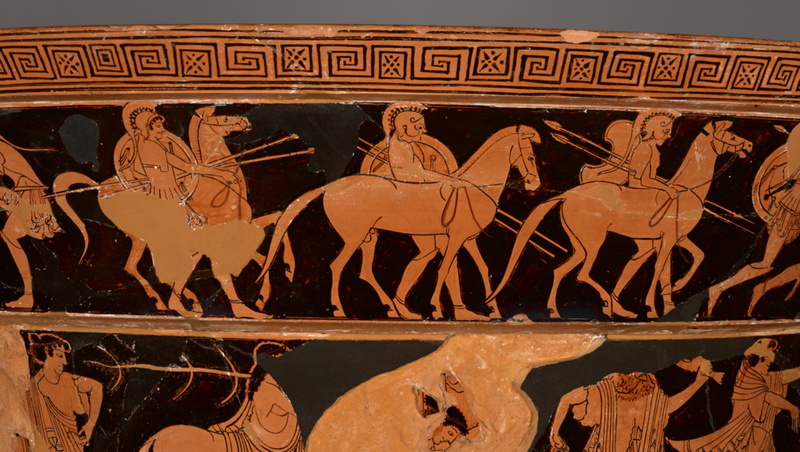 The next group of Amazons consists of a trio walking to the right, each with a horse and two spears. The leftmost Amazon stands before her horse, the other two behind. The rightmost Amazon has a pelta (light curved shield) instead of a hoplite shield. The third group of Amazons proceed at a faster pace, two of them (one armed as a hoplite, the other with an axe) in full flight to the right, together with another Amazon trying to restrain her horse. At far right, a trumpeter. 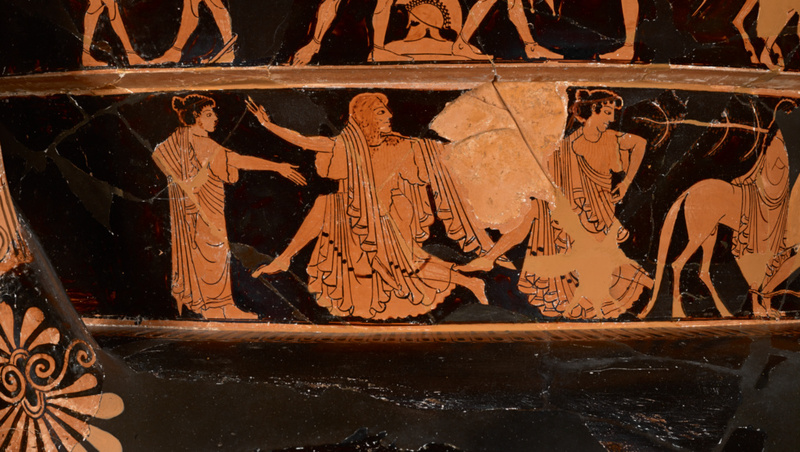 On the lower frieze of side A: three of Herakles' labors. 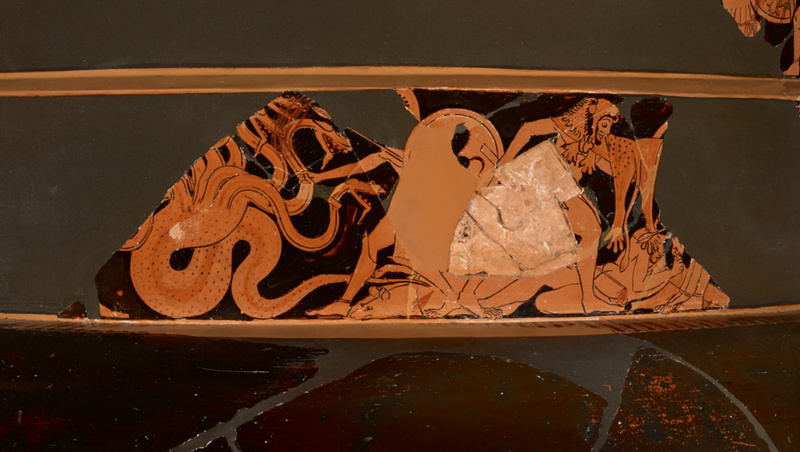 From left, Herakles (only his foot is preserved) and Iolaos attack the Hydra. Iolaos wields a flaming brand to cauterize the monster’s severed necks, and his hoplite shield bears an image of Pegasos. 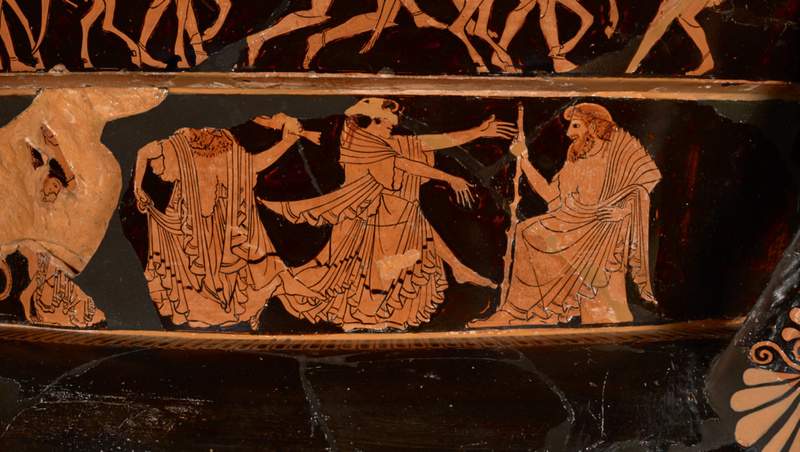 He stands before the wounded two-headed dog Orthos, who belongs to the next scene, Herakles fighting Geryon (of whom only three front legs, a spearhead and the edge of a shield survive). Between them is the fallen Eurytion, bleeding from a wound in his belly. Further to the right, a seated Athena (only her helmet, shield and part of her legs are preserved) looks back at this encounter. Before her, Herakles (with club, lionskin, and quiver) attempts to collect the apples of the Hesperides from the tree. The dragon Ladon is represented as a three-headed snake coiled around the trunk. To the far right, Atlas stands frontally with right hand on his hip. On the lower frieze of side B: Peleus wrestle with Thetis (both figures are only partially preserved; part of a snake’s tail at lower left), watched over by the centaur Chiron at left. A pair of Nereids, each wearing a chiton and himation, flees both left and right. At far left, a standing female figure with her arm outstretched; at far right, Nereus, seated with a staff. 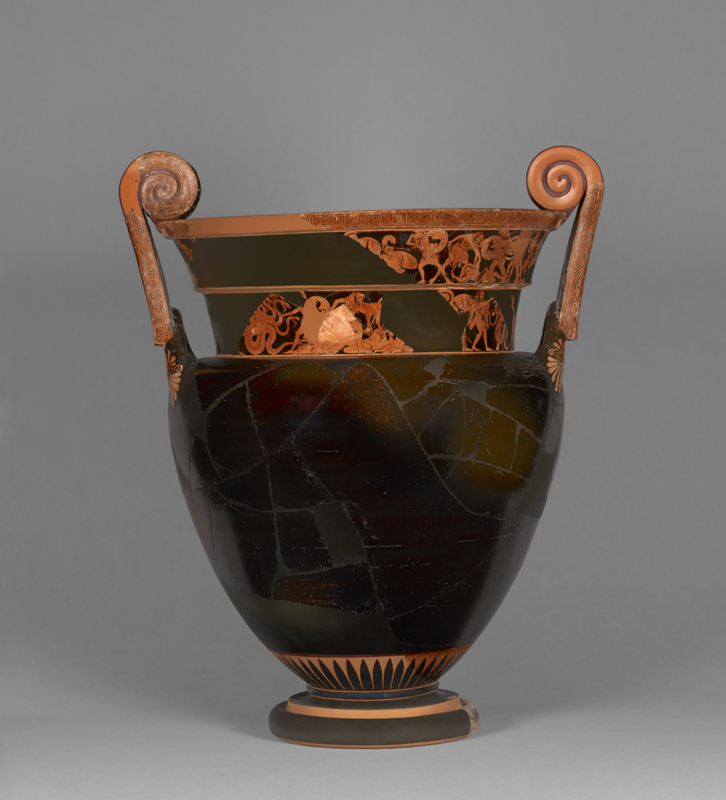 Fragments of the vase were once included in a heavily restored krater in the Musée du Louvre (G166), formerly in the Campana Collection. They are now on loan to the museum and incorporated into the vessel (four of these fragments belong to the neck friezes). 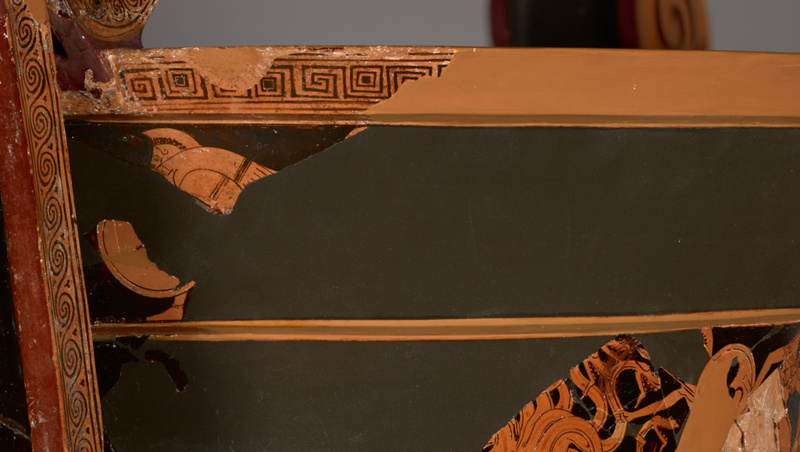 Additional fragments that belong with this vase are 86.AE.587, 97.AE.58.2 and 98.AE.82.1-.12. Gordon McLendon (Dallas, Texas), donated to the J. Paul Getty Museum, 1977. Pottier, E. Vases Antiques du Louvre III. (Paris: Librarie Hachete, 1922), pp. 193-194 (G166), pl. 127 (Louvre fragments). Beazley, J.D. Attische Vasenmaler des rotfigurigen Stils (Tübingen: Mohr, 1925), 73.34 (Louvre fragments). Beazley, J. D. Attic Red-figure Vase-painters (Oxford: 1942), 124.44 (Louvre fragments). Beazley, J. D. Attic Red-figure Vase-painters. 2nd ed. Oxford: 1963, 187.52 (Louvre fragments). Greifenhagen, Adolf. Neue Fragmente des Kleophradesmalers. Sitzungsberichte der Heidelberger Akademie der Wissenschaften, Philosophisch-Historische Klasse. 1972, 4. Abhandlung, pp. 24-41. Giroux, Hubert. "La cratère à volutes du peintre de Berlin au Louvre," RA 23 (1972) 243-250, figs. 6-7 (handles and foot). Frel, Jiří. "The Kleophrades Painter in Malibu." The J. Paul Getty Museum Journal 4 (1977). pp. 63-76, pp. 63-70, figs. 1-12. Frel, Jirí. Painting on Vases in Ancient Greece: a Loan Exhibition from The J. Paul Getty Museum. Exh. cat., Art Gallery, Loyola Marymount University, March 20-April 22, 1979, no. 21. The J. Paul Getty Museum Appointment Calendar (Malibu: J. Paul Getty Museum, 1981), week of July 6. Pasquier, Alain. "Nouvelles decouvertes a propos du cratere d'Antee peint par Euphronios," Revue du Louvre 1, 1981, pp. 3-9, pp. 3-4, figs. 6-7. Brommer, Frank. 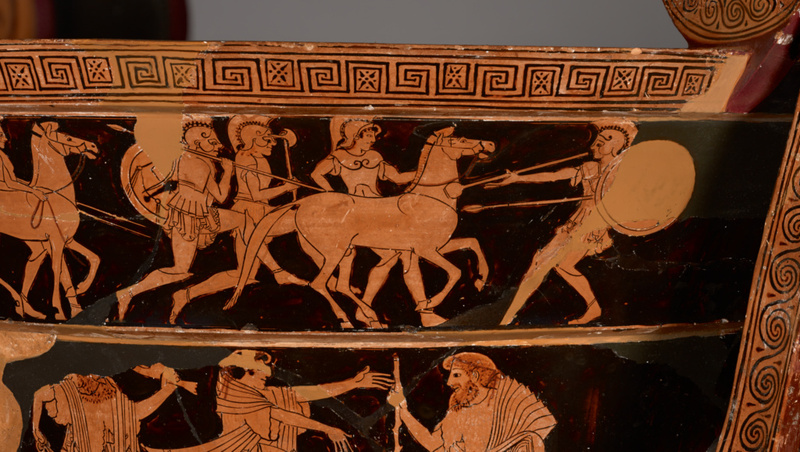 "Herakles und Theseus auf Vasen in Malibu," Greek Vases in the J. Paul Getty Museum 2. Occasional Papers on Antiquities 3 (1985), pp. 183-228, figs. 6, 15, 18 and 20. Neils, J. The Youthful Deeds of Theseus. (Rome: G. Bretschneider, 1987), pp. 71-72, n. 320. Beazley Addenda: Additional References to ABV, ARV2, and Paralipomena. 2nd ed. Compiled by T. Carpenter with T. Mannack and M. Mendonca. Oxford: 1989, 188. Boardman, John, et al. "Herakles." In Lexicon Iconographicum Mythologiae Classicae V (1990), pp. 1-192, p. 7, no. 1702; pl. 9; p. 77, no. 2502. Kokkorou-Alewras, G. "Herakles." In Lexicon Iconographicum Mythologiae Classicae V (1990), p. 101, no. 2680. Pipili, Maria. "Hippodameia I." In Lexicon Iconographicum Mythologiae Classicae V (1990), pp. 434-440, p. 690, no. 23. Icard-Gianolio, Noelle, and A.-V. Szabados. "Nereides." In Lexicon Iconographicum Mythologiae Classicae VI (1992), pp. 785-824, pp. 805-6, no. 287. Pipili, Maria. "Nereus." In Lexicon Iconographicum Mythologiae Classicae VI (1992), 824-837, p. 830, no. 72. Robertson, Martin. 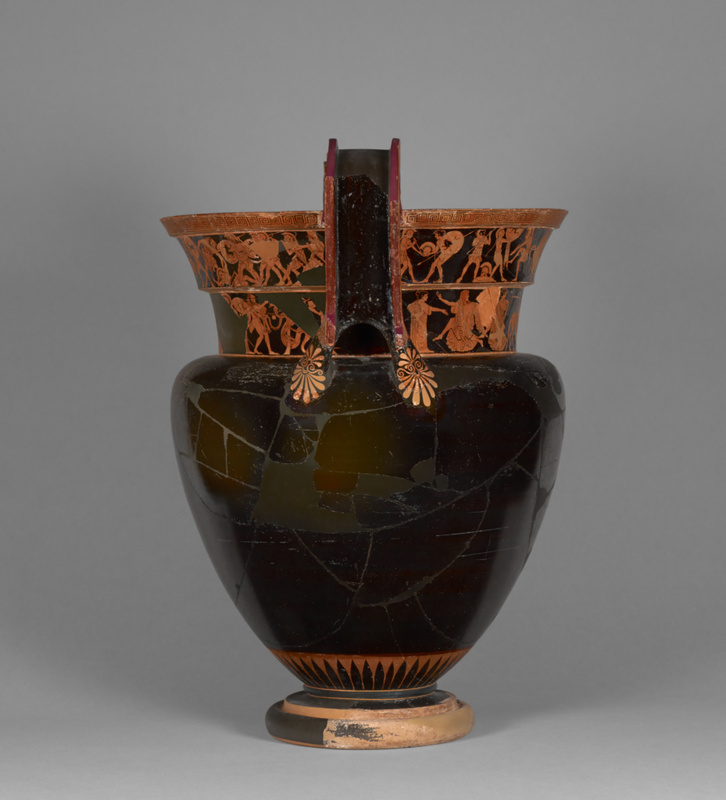 The Art of Vase Painting in Classical Athens. (Cambridge: Cambridge University Press, 1992), p.60. Kunze-Götte, E. Der Kleophrades-Maler unter Malern schwarzfguriger Amphoren, Eine Werkstattstudie(Philipp von Zabern: Mainz am Rhein, 1992), 76, 89, 124, fn. 58. Gantz, Timothy. 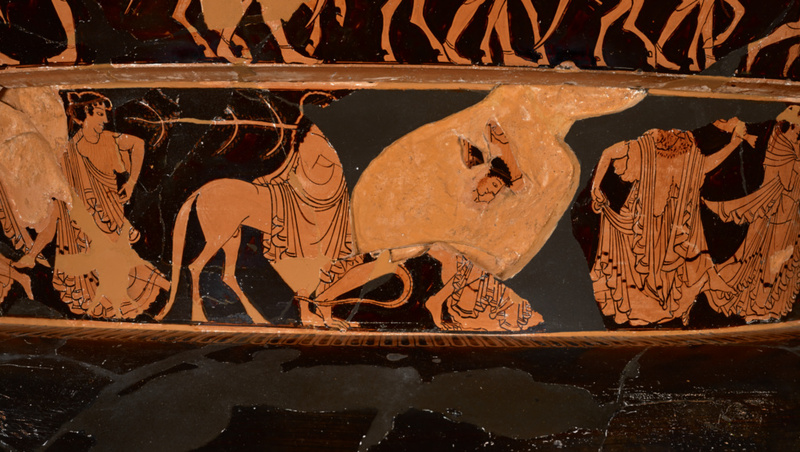 Early Greek Myth: A Guide to Literary and Artistic Sources, Vol. 1 (Baltimore: The Johns Hopkins University Press), pp. 412. Kossatz-Deissman, Anneliese. "Eine etruskiche Feldflasche mit Herakles am Hesperidenbaum." In Erika Simon und Mitarbeiter, "Nachrichten aus dem Martin von Wagner Museum." Archäologischer Anzeiger (no. 1, 1994), p. 56, fig. 61. Schreiber, Toby. Athenian Vase Construction: A Potter's Analysis (Los Angeles: J. Paul Getty Museum, 1999), fig. 16.17. Diez de Velasco, Francisco. "Marge, axe et centre: iconographie d'Héraclès, Atlas et l'arbre des Hespérides." In Héros et héroïnes. Kernos, suppl. 10. Vinciane Pirenne-Delforge and Emilio Suarez de la Torre, eds. (Liège: Centre int. d'Étude, 2000), pp. 204- 205. Norfolk, Lawrence. In the Shape of a Boar (New York: Grove Press, 2001), p. 4n12. The J. Paul Getty Museum Handbook of the Antiquities Collection (Los Angeles: 2002), p. 72. Arvanitaki, Anna. Hero and the Polis: The Example of Herakles in the Archaic Iconography of Corinth (Thessaloniki: University Studio Press, 2006), p. 68, n. 12. Gaunt, Jasper. 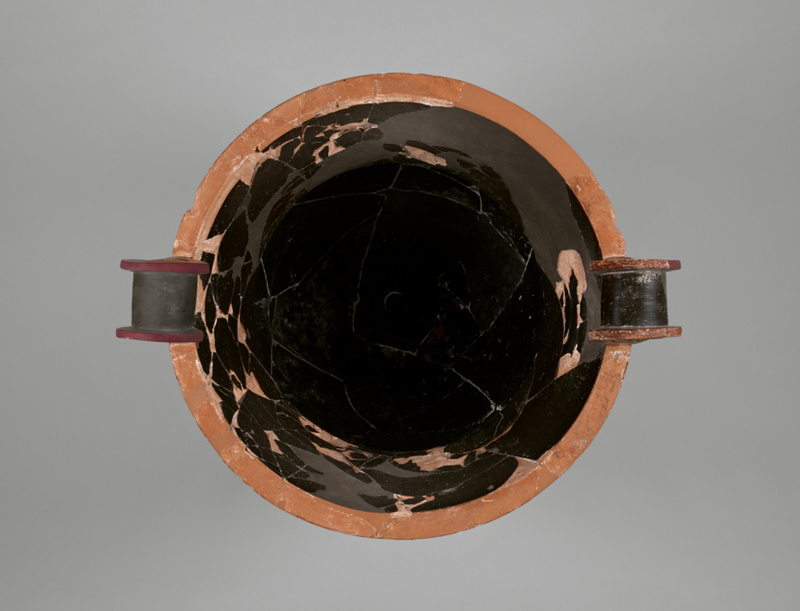 "The Attic Volute Krater." Phd. Diss. (NYU, 2006), pp. 529-530, cat. 50. Mommsen, Heide. "Prometheus oder Atlas? Zur Deutung der Amphora München 1540" In Athenian Potters and Painters, vol. 2. John H. Oakley and Olga Palagia, eds. (Oxford: Oxbow Books, 2009) 201-211, p. 203, fig. 5. Mitchell, Alexandre G. Greek Vase-Painting and the Origins of Visual Humour (New York: Cambridge University Press, 2009), p. 220. The J. Paul Getty Museum Handbook of the Antiquities Collection. Rev. ed. (Los Angeles: J. Paul Getty Museum, 2010), p. 72, ill.
Padgett, Michael J. "The Serpent in the Garden: Herakles, Ladon, and the Hydra." In Approaching the Ancient Artifact. A. Avramidou and D. Demetriou, eds. (Berlin: de Gruyter, 2014), pp. 49-51. Saunders, David. "An Amazonomachy Attributed to the Syleus Painter." In Athenian Potters and Painters III. John. H. Oakley, ed. Oxford: Oxbow Books, 2014, p. 195, footnote 45. Rodriguez Perez, Diana. "Guardian Snakes and Combat Myths." In Pflanzen und Tiere auf Griechischen Vasen, ed. by C. Lang-Auinger and E. Trinkl. Vienna, 2015, 153, fn. 8, 154, fn. 24. Williams, D. "Beyond the Berlin Painter: Toward a Workshop View." In The Berlin Painter and His World. exh. cat. J.M. Padgett, ed. (New Haven and London: Yale University Press, 2017), pp.154, 176, fig. 6. Padgett, J. M. (ed. ), The Berlin Painter and His World. exh. cat. (New Haven and London: Yale University Press, 2017), p. 337, under no. 67, footnote 1, entry by J. Gaunt; p. 382, under cat. no. B129-B130. Padgett, J.M. "The Berlin Painter: As We Know Him." In The Berlin Painter and His World. exh. cat. J.M.Padgett, ed. (New Haven and London: Yale University Press, 2017), p. 61n34. Gaunt, J. "The Berlin Painter and His Potters." In The Berlin Painter and His World. exh. cat. J.M.Padgett, ed. (New Haven and London: Yale University Press, 2017), p. 103n83.